“A conservation group representing backcountry skiers says the time is ripe to limit snowmobiles in the Togwotee Pass area as officials rewrite the Bridger-Teton National Forest management plan.” From “Ski group pushes to limit snowmobiles on Togwotee [pass area]. Jackson Hole News and Guide. By Cory Hatch. 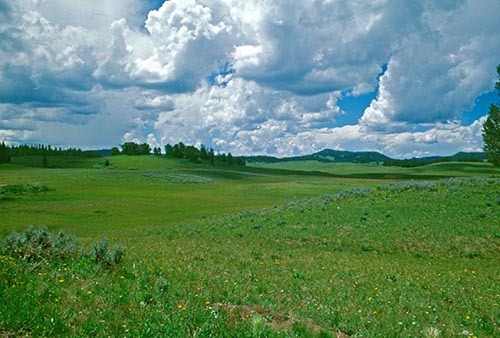 The Togwotee Pass area is a large area of forest and beautiful meadows NE of Jackson Hole, rising up to the Continental Divide. To its north is the designated Teton Wilderness Area, not to be confused with Grand Teton National Park. Summertime has shown a great environmental improvement because the cattle allotments have been bought out and the lush meadows with willow-sided streams provide much habitat for moose and elk, and great grizzly bear habitat too, but in the winter it has become a snowmobile raceway with the ever more powerful sleds racing 60 t0 80 mph across the meadow, and increasingly directly violating the Wilderness Act by entering the Teton Wilderness. Some get stuck there almost every year and have to be rescued. This illegal entry into the Teton Wilderness has got to be harmful for hibernating bears, who tend to use the north-facing slopes where the snow lingers longest. Moose do use these areas in the winter, and Wyoming’s moose population is on the decline (no it’s not the wolves; the moose are undernourished). Skiers are being crowded out by the uncontrolled snowmobile use. The argument from Togwotee Lodge, which rents snowmobiles, is incredibly weak — “the majority of snowmobilers do not illegally use the Wilderness area.” Well, the majority of shoppers don’t shoplift, so I suppose those who do should not be monitored and prosecuted. 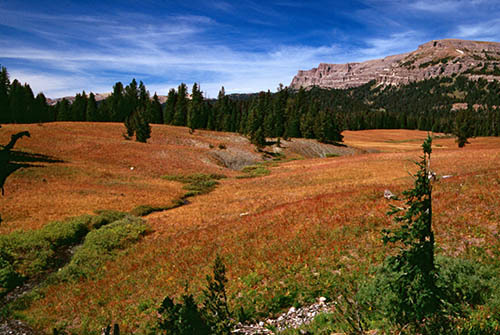 Meadows beneath Breccia Peak near Togwotee Pass. Photo Ralph Maughan. View to the north. The mountain is the Teton Wilderness boundary, and snowmobiles are increasingly illegally crossing over and pouring into the supposedly motor-free Teton Wilderness area of the Bridger-Teton National Forest. « New congress gives new Forest Service chief a grilling in committee hearing.